Beware the font that thinks too much of itself. Case in point: Dactylographe, a shareware TrueType font that has been on offer on PCWorld.com since 1997 with the bold claim that it is the champion to replace Courier as a text face. 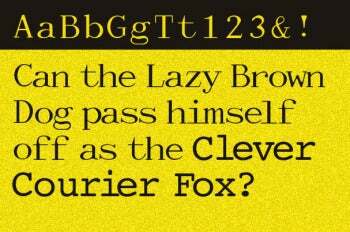 Dactylographe is a demo, a one-font character set meant to give readers a taste for the full package of weights. The style borrows from the original Bodoni, a face designed by Giambattista Bodoni around 1798. The Bodoni style is drawn with less blocky serifs than Courier and with high contrast between the thick and thin strokes. "The font [Dactylographe]," designer Michel Bujardet writes, "has a much better rendition on paper…makes it a good candidate for printouts, where Courier does not do the job." There are a number of problems with Bujardet's claim, but the most glaring one is that a variable width face like Bodoni and a monospace set like Courier serve two very different masters. To throw them at each other in a face-off does both fonts a disservice, although it is always tempting to carry on against a style that has been around so long that it threatens to trip over its own descenders. Unfortunately for Dactylographe, Courier has grown up rather nicely since the days of electric typewriters with cast letterforms. IBM commissioned Howard Kettler to create the first rendition of Courier in 1955. Remastered by Adrian Frutiger for the IBM Selectric series of typewriters--and still later tweaked by Monotype and Microsoft during the leap to desktop publishing--Courier has been a stable in electronic font libraries ever since. Used and misused, Courier remains a steady choice for typing programming code behind the scenes where legibility is key, or for any other task calling for a monospace font. Programming language is something Dactylographe should stay well away from and it's not my go-to choice for printed text either. Dactylographe is a flawed collection of uneven characters hampered by ragged terminals and odd weight fluctuations, much like this reviewer. Mr. Bujardet has been in the typography game since the early 80s, when desktop publishing was gaining ground over hot metal and photo type. Match Fonts, his foundry, continues to publish in the age of pixel-rendering and bezier curves, but Dactylographe is an early work with rendering that looks rushed and unfinished. True, the font can function as a text face at 10 points and below where the weight disparities are less noticeable, but even here lowercase letters like g and t will give any reader a bumpy ride. Dactylographe gets no points as a replacement for Courier. As an artifact of early digital design, it rates a download for the collection, but on page and screen I'd give it a pass. Still looking for a lovely text face to make your day? Try Sorts Mill Goudy, Barry Schwartz's revival of the classic Goudy Old Style. Note: To use this font, unzip the folder and install the .ttf file in the folder C:\Windows\Fonts. Note that the font won't appear in your applications until you close and re-open it. For more guidance see How to Install and Uninstall Fonts in Windows. Dactylographe takes on Courier with a vengeance, but loses ground with uneven styling and clashing letterforms.